I've been making random builds in my off time for a little while now, so I figured it was a good a time as any to finally start getting them down for other people to see and use. This is also my starter build for Synthesis league, so I'll be posting updates as I get around to major milestones. I'm still working on early endgame Synthesis right now, but I can say with some certainty that y'all are sleeping on Fireball right now. Update: I've added Passive Trees for Heirophant and Ascendant to the Path of Building pastebin. I've also added a section talking about possible other classes you could choose instead of Chieftain, as well as a fairly sizable DPS gain I forgot to add to the build. If you decide to run this, any feedback would be greatly appreciated for how I can improve this build. Please note that my current gear in game is far from optimized, so don't take what I'm wearing as the end-all-be-all for this build. 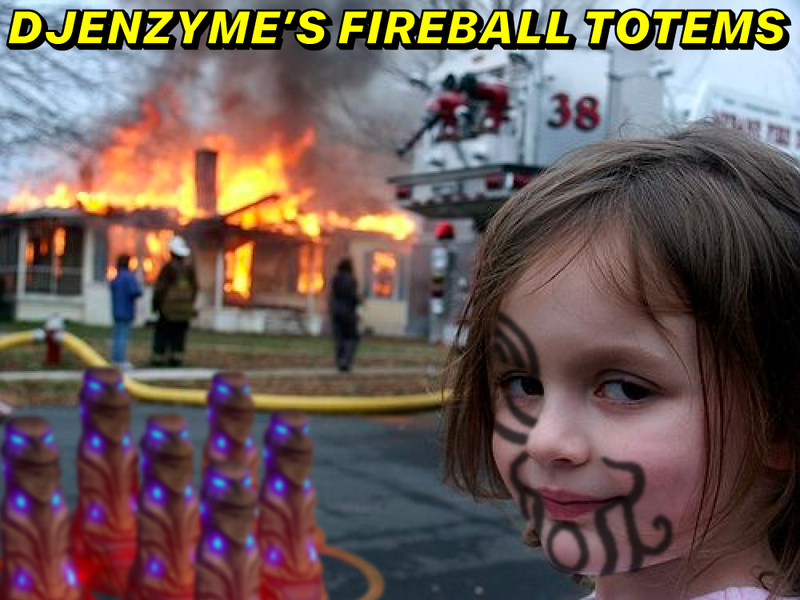 - Why Fireball? Why not use Holy Flame Totem instead? - Can I use [other fire spell] instead of Fireball? Yes, just make sure to adjust your passives accordingly. - Why Chieftain instead of Heirophant? Overall, Chieftain has better defensive ascendancy nodes than Heirophant does. (taunt on hit from Tukohama, War's Herald, totem leech from Hinekora, Death's Fury, etc.) Also Chieftains are just cooler. + Very interactive for a totem build. + Fun resource management gimmick. + Should be fairly adaptable to Summon Holy Flame Totem. + You can start leveling key skills (Fireball and Spell Totem) early. + You actually get to build crit instead of just grabbing Elemental Overload. + Multiple starting class options, Ascendant and Heirophant are both just as viable, if not more so. - Requires good management of Flask uptime. - Fireballs sometimes have trouble hitting fast targets. - Easy to run out of mana if you're not careful. - Running out of mana flask charges can be potentially deadly. The Soul Mantle is a great choice for totem builds, mostly because it's one of the only equips in the game that offers +1 to maximum summoned totems. Not much else needs to be said. I'll explain how to deal with that nasty Inflict a random level 20 Curse whenever one of your Totems dies effect farther down in the guide. Same thing as the Soul Mantle, getting a shaper shield like this one (although probably with better affixes than mine) offers a ton of extra damage to this build as you progress through the last few acts, as well as when you start maps. I'm mostly going with kite shields for the extra elemental resistances you might lose out on due to having Soul Mantle as your top armor. However, if you're feeling confident in your resistances, you can go for a good spirit shield instead. I'm sure this might be a bit of a weird one, but this flask is VERY important to have, especially after you've gotten yourself a Soul Mantle. I'll go more into explaining how this is used later, but definitely get yourself one or two of these. Some good Uniques to consider picking up are things like Doedre's Scorn for the better curses, Doedre's Damning for the third curse and synergy with Doedre's Scorn, and Voidbringer for the extra DPS. Doryani's Catalyst is also a good option as a main weapon, but it does eventually get outstripped by better Rare Sceptres, and you also don't get to benefit from the Elemental Damage Leeched as Life that it provides. You want to ensure that you have a healthy amount of survivability before you start looking into getting more damage for your build. Dark Arts is a very good early pickup if you decide to run Flame Dash, as well as nodes like Quick Recovery, Mental Rapidity, and Constitution. You shouldn't take Mind Over Matter or Ancestral Bond until you're confident in your ability to run them. I got Ancestral Bond roughly around the same time that I got Flammability in Act 3, and got Mind Over Matter once I got my whole Soul Mantle setup going, but as always, it's up to you. Overall, what class you choose is fairly up in the air overall, and I'd say it's probably gonna come down to aesthetics as much as anything else. That being said, I've provided what I think are my personal rankings of each of the three down below, so you can get a good idea of where each one stands in some major areas. Chieftain has by far the best utility and survivability of the three, due to passives that give Totems the ability to taunt and leech life to you, make enemies deal less and take more damage, etc. However, for all that tankiness, you are giving up the opportunity to have 7 Spell Totems instead of 6, which does amount to a pretty hefty DPS loss overall. Heirophant's raw DPS and resource regen is definitely better than the other two options, and they're also a little bit easier to gear, due to Conviction of Power giving some extra Elemental Resists through the free Endurance Charges. They also don't have to use the Orb of Storms setup that I use to generate Power Charges. Ascendant lies somewhere in the middle between the two, with added benefits that aren't available to the other two Ascendancies. They end up getting the best of both worlds, with both the Totem Leech and extra Totem, and also get free Arcane Surge from the Heirophant Ascendancy Node as an added bonus, freeing up their Curse setup for an additional support like Increased Area of Effect. Bandits: Kill 'em. Nothing is worth the 2 passive points. Pantheon: Solaris and Ryslatha are my go-to. The order of which Ascendancy you pick up first is up to you, it just comes down to whether you wanna focus on getting more survivability or more damage first. Your main link setup. Nothing is a massive requirement outside of Multiple Totems Support, so after you've got that in there, just add whatever gives the most DPS, or just works the best. Spell Totem Support is in brackets because eventually you're gonna get that link from Soul Mantle, but you're gonna need one until then. Elemental Focus can replace Immolate and Combustion if you're running a 5L setup or just want more crit rate or something. However, if you do add it, make sure to remove Combustion, as it doesn't work at all with Elemental Focus. Fire Penetration or Added Fire Damage is a good alternate gem if you've got some extra red sockets in your setup. I use helmet here because I'm running a Doedre's Scorn in my build, but it's not a required equip, so it's really just up to you and whether or not you think the bonus elemental damage and curse levels are worth the loss of potential resistances. Enfeeble is a good replacement for either Flammability or Assassin's Mark if your survivability doesn't feel up to snuff, or even one of your support gems if you're feeling extra spicy and got your hands on a Doedre's Damning. Technically, Assassin's Mark is more DPS, but if you're running Combustion, the increased ignite chance might be more worth it. Standard stuff. Vaal Haste isn't totally necessary or anything, it's only really there as a nice, free bump in DPS. Keep your Immortal Call and Cast When Damage Taken low enough level that they proc fairly regularly. This is your secondary buff factory, and is a bit of a theorycraft setup for me right now. It will only work with this setup once you pick up Avatar of Fire, so if you don't feel like getting it for whatever reason, replace Increased Critical Strikes with Immolate. You won't be able to proc the reduced Fire Resistance effect of Combustion as consistently, but it should still work just fine for bosses. If you're playing Heirophant, you can also replace Power Charge on Critical with something like Increased Duration, Increased Area of Effect, or Faster Casting. Your three main buff skills. Reserve as much mana as you can manage, but don't overdo it. You're not an aurabot. Anger is the best in the early game, because the flat Fire Damage to Spells bonus works well with Fireball's 180% damage conversion rate. However, as you progress later into the game, you're gonna find that Zealotry will eventually outstrip it in terms of DPS. If you're confident in your flask uptime and mana management, you can also run Herald of Ash in this setup for a bit of extra damage. This is your main source of mobility, so it's important to always have it somewhere on your setup. Fortify Support - Shield Charge is also viable if you want a little bit more physical damage reduction instead. Free damage. I prefer Flame Golem just because you can potentially link it with an Combustion for a bit of extra Fire Resist Down, and to let Fireball benefit from both Elemental Focus and Immolate. The DPS difference is fairly small, however, and the golem doesn't offer enough AoE to make that synergy super viable for mapping. A bit of extra armor, but nothing too important or too special. Run it if you find yourself getting deleted a little too quickly, or if you've got some extra sockets to fill. Most of the damage is gonna get soaked by your Totems anyways, so it's not a big deal if you have to drop it. I'm glad you asked, dear reader, because this is where the build REALLY gets fun. DON'T EVER REACH FULL MANA. Actually, you can reach full mana, but due to Soul Mantle's Inflict a random level 20 Curse whenever one of your Totems dies effect, you need to have that curse immunity flask effect active whenever you're re-summoning your totems. Just focus on keeping the flask active for as long as possible, and you'll be fine. The nice side effect of having both Mind Over Matter and all that mana flask uptime is that it acts as a solid amount of de facto health regen, and helps support the life leech you get from Hinekora, Death's Fury. The easiest way to do this is to just keep re-summoning your totems constantly, effectively playing the build similar to what you might see a Summon Raging Spirits Necromancer doing. A Voidbringer can help with this too, since it offers a unique affix that gives (40-80)% Increased Mana Cost of Skills. tl;dr: Put a wall of Totems between you and anything that could potentially even look at you funny. Always keep your mana under your maximum for that sweet 20 seconds of curse immunity, and keep up your Curses and buffs as much as you can. Leveling: Molten Strike - Ancestral Call and Holy Flame Totem (or whatever you're comfortable leveling with) are fine for early game mapping before Fireball gets dummy good, but it's a good idea to keep Fireball and Spell Totem Support socketed as much as you can. If you've got one, a Tabula Rasa can be good for the DPS until you can get yourself a good Soul Mantle and a few good Warding flasks. Again, if you decide to run this, any feedback would be greatly appreciated for how I can improve this build. If I'm online, you can message Chjongy in-game, otherwise just leave your questions here in the thread, or in my PM's. I'll add an FAQ when I feel like it's necessary, but for now just feel free to reply with any questions you might have. would love to see a video of some mid tier map clearing! Ancestral bond doesnt stop shield charge from hitting (it only makes it deal no damage) therefore you can use fortify sup on it no problem at all. Your pob includes bonus from 3x power charges, but I don't see how you are getting those. You can't get them from Assassin's Mark, since you don't actually kill anything yourself... just curious. That, that is, is. That, that is not, is not. Is that it? It is. Yeah you don't actually end up getting many power charges so I've been meaning to get rid of those. I did get them on occasion while I was mapping but I think that was due to some weird interaction with the local ignite chance from Flammability if I had to take a guess.